We hear a lot about “being relevant” today. New styles, new experiences, and new technology—that’s what the world needs. Yet here we are discussing something that started more than 100 years ago. Still we hear, “Pray for North American missions” and “Give to the Annie Armstrong Easter Offering.” Can we never “check this off” and say, “Done!”? We look at our part of the world, North America, to find the answer. It starts in our state, our city, our neighborhood. We can study census reports and news articles about population, religions, denominations. We can also open our eyes. Where do we look? What do we see? In our neighborhoods, we see the elderly, the lonely, the disabled, the affluent, the jobless, and the overwhelmed. Where we shop, we see the stranger, the handicapped, the sorrowful, and the socialite. We see people from all around the world who are now our neighbors. Too often, in too many faces, we see hopelessness. Nothing is more relevant in our world today than praying for and giving to the work of sharing His love, beginning where we are. The dates for the 2015 week of prayer are March 1-8. Armstrong Easter Offering and prayer guides will be provided Sunday, March 1. Ask God to guide you in your giving. 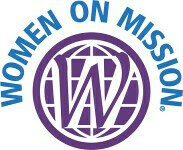 Women on Mission will meet at 7 p.m. Monday, March 9 at the church. All our ladies are invited to join us for a time of study, prayer, and fellowship.